The factory radiator on factory cars leaves a bit to be desired. Just a little too small for the best cooling, you can often be down on horsepower when pushing the car hard. Koyorad has seized this opportunity, and created a direct fit radiator for the GTR which uses factory bolt locations. In addition, the OE fans will bolt on directly, making the Koyorad radiator an easy and quick installation. 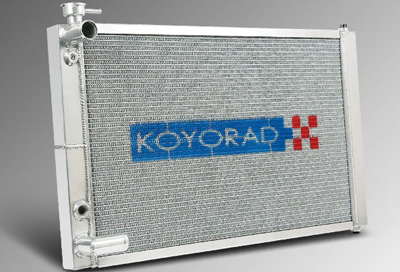 Featuring Koyorad's new 36mm "VH" series radiator core, Koyorad was able to maximize heat transfer for the ultimate cooling solution. Each Koyorad all aluminum radiator core is hand assembled, Nocolok brazed, then TIG welded by hand with the finest aluminum available. These characteristics that Koyorad has been strict in following has earned their great reputation in performance and radiators worldwide. ModBargains.com can install the Koyorad Radiator in your GTR! Call 714-582-3330 and set up an install appointment today.